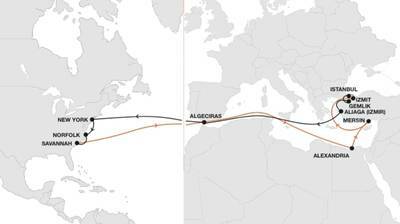 German-based cargo container shipping line Hapag-Lloyd AG is launching a new liner service offering a direct connection between Turkey and the US East Coast. The Turkey North America East Coast (TNE) service will operate every nine days between the Turkish seaport of Marmara (Izmit, Istanbul and Gemlik) and the US ports of New York, Norfolk and Savannah, said a press release from the world's fifth largest container carrier in terms of vessel capacity. With a fleet of 222 modern container ships and a total transport capacity of 1.6 million TEU, Hapag-Lloyd is one of the world’s leading liner shipping companies. The Company has around 12,500 employees and 394 offices in 127 countries. Hapag-Lloyd has a container capacity of approximately 2.6 million TEU – including one of the largest and most modern fleets of reefer containers.